From time to time, as a programmer, you come across an exciting emerging filmmaker at the beginning of their career, knowing that one day, you're going to want to do a retrospective of their work. For me, Duncan Cowles is one of those filmmakers. 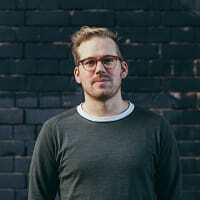 Having graduated from Edinburgh College of Art in 2013, he has already made four shorts that have screened at festivals internationally including Flatpack in both 2013 and 2014. Specialising in documentary, his work is brilliantly droll, and personal without falling into self-indulgence. His graduation short film, Radio Silence recently went online, and I caught up with him to discuss some of the themes in the film, and the issues you face when turning the camera onto your own family. SG: So after a year or so of festivals, Radio Silence is now available online. It’s a very personal film - were you at all hesitant or nervous about making it available online for anyone to see? I’m not suggesting you were going to get trolled in the comments, but I guess the safety net of the auditorium is removed when it goes online. DC: Yea, I was pretty terrified at putting such personal material out there. My experience putting The Lady with the Lamp online and getting both hugely positive, and also quite negative feedback about my Mum had prepared me to a certain extent, but this film is a lot more personal, and definitely makes me feel slightly more vulnerable. It’s good to put yourself out your comfort zone though. When you put a film online, it almost feels like you are giving up ownership of it in some way, but I figured that if my Dad didn’t mind, I should just do it and try not to think about it too much. It needed to be out there in the world, there’s no point in a film just sitting on my hard drive entertaining nobody. SG: Some of the conversations you have with family members (particularly with your dad at the end) are quite candid – they can't have been easy, but do you think having the camera there made those discussions less difficult at all? DC: Yea, I think I use the camera as a device to force me to confront things that I wouldn’t otherwise have been brave enough to do. Particularly with the last interview, I put it off for so long it looked like I might not even go ahead with it until being more or less forced to by my tutors at Edinburgh College of Art. If I can hide behind the camera, it distances me from the immediate reality of the situation and allows me to process it later in the edit suite. In this particular edit, I was mostly on my own and I got a lot of time to really think about it and reflect upon what I was finding out, that’s when things became a bit more ‘real’ in some ways. It’s odd that things sometimes become more real retrospectively, maybe that says something about me, or maybe it’s wider than that and says something about the way we all experience and live our lives today. SG: The film has already had over 30,000 views, which is terrific, and reading the unanimously positive comments on Vimeo must be a great feeling. You obviously put some thought into when you were going to put it online (father’s day). How easy was it to get it into festivals, and now that it’s online, does that mean its festival run is finished? DC: Yea definitely. I spent all of Father’s Day pushing the film online in a hope to get it out there best I could. I’d been waiting for months for the optimum day to launch it. Seeing it go down so well is a really nice feeling indeed. It’s great to hear people saying things like they were touched by it and have then gone to phone their Dad for a chat and things like that. Makes me feel like the film was all the more worthwhile to make. It’s also been a complete privilege to receive some very personal and touching stories from others about their own families and situations. I hope the film can continue to reach people in the way that it has done this past week for a long time to come. It wasn’t an easy film to get into festivals, the length will have no doubt put a lot of programmers off. It’s also a film that (like many) works a lot better with an audience and perhaps on solo viewing doesn’t always grab people quick enough. The film has played lots in Scotland, and some in the UK as a whole, but further afield than that it has struggled to be programmed for more than the odd festival here and there. There are some more public screenings to come, but not huge amounts as I’m mainly touring my newer film Directed by Tweedie. SG: Were you able to make it to any of the screenings? And what was the response like from audiences? DC: Audiences have generally engaged very well with the film and it has prompted some great conversations. Questions are normally asked of what my Dad thought and said to me after I first showed it to him. The answer being simply: “good structure”. … words aside though, he chuckled away throughout and a couple of weeks later went on to attend the premiere of the film at Edinburgh’s Filmhouse with a big smile on his face, which meant more to me than anything else. SG: I think it’s difficult not to be charmed by you and your family – they’ve been the subject of three of your four shorts so they must be getting pretty used to you having your camera with you, but what is it about your family which entices you to film them? DC: I always have to film what I’m most motivated to film, and up until now that has been my family. I’ve wanted to film them all so that I can in some way preserve and record the memory of them whilst I still can. It’s like a mini-protest against time, getting older, things changing and me personally being quite scared of that. So it’s a very personal motivation, but if I can create a story, or make a film that is insightful and can become universal, then I can bring something interesting to the rest of the world. When someone watches one of my films and then reflects upon their own lives, and even better then acts upon it by phoning their Mum, Dad or son for example – then I’ve achieved my goal. SG: The film uses some gorgeous snippets of home movie footage – does this mean filmmaking runs in the family, or were you the first to really take an interest in being a professional filmmaker? DC: I would say I’m the first to give it a go on a professional level. There is definitely an interest from my Father and indeed his Father, but not as a career path. There are a lot of artistic people in the family though. Both my Grans are painters for example, and my brother is a graphic designer/musician. I did come across some macro footage of Spiders under a microscope that had been filmed on 8mm by my Grandpa, and they are stunning. More than enough there for an experimental short. There was potential in him for sure. SG: Directed by Tweedie is the perfect follow up to Radio Silence, and it’s currently doing the festivals around the world (including Flatpack in March earlier this year). Can you tell us a bit about it and when we can expect to see it online? The film will be up online later in the year I hope, or early next year at the latest. I will again be looking for the appropriate time and context to launch it. SG: You’re based up in Edinburgh, and I know you’re working on a film with animator Ross Hogg (more on that shortly), but is there quite a filmmaking scene up there? And who are the key players? DC: Yea, for sure. Across Edinburgh, Glasgow and even up into the Highlands and Islands I’d say there’s a really appealing and growing film scene. Small in comparison to say London, but there’s some real high quality stuff getting made, both in terms of short and feature length filmmaking. I work at the Scottish Documentary Institute so I’m aware of and connected to a huge range of up and coming and established talent. We run a talent scheme for short docs to get commissioned each year called Bridging the Gap, and there’s the Scottish Shorts scheme run by the Scottish Film & Talent Network that commission short fiction work each year. There’s also lots going on in Glasgow with places like Sigma Films beginning to output some real high quality shorts and features. I’ve seen a real rise in the past 3 to 4 years. It’s nice because there’s a real community, and a lot of us are all mates, so we’ll meet up in the pub most weeks and chat about our ideas etc… there’s too many key players to mention. SG: So your film with Ross, can you tell us about that? And what’s the current timeline for that project? DC: We’re almost done. It’s a live action, experimental, animated documentary portrait about Ross’s gran. (That’ll probably end up being the synopsis because it’s a hard one to describe.) It explores memory, but not in a way that you’ve seen before. We were kindly supported by Creative Scotland to make the project, which was brilliant and the finished result is going to be quite different from anything either of us have done before. SG: The three shorts in the Big Dunc series you’ve made with Will Anderson and Ainslie Henderson are bloody great. Please tell me you’re making more… In fact, I sense you’ve probably got a sketch show in you, do you have any plans to move away from documentary, and move into drama or comedy? Yea, I wouldn’t rule out drama or comedy. Documentary has been the focus up until now but I’m open to anything as long as I want to do it enough. When I run out documentary ideas, or think of an idea I want to do as a documentary but can’t, then perhaps fiction is where I’ll have to go. As for comedy, I’ll probably always look for a way to bring that into my work, no matter what the form or exact topic. People don’t laugh enough, especially when it comes to documentary. A lot of documentaries can end up being about quite depressing topics, and of course there’s a place for that, and indeed a real importance in it, but if you watch a lot of them, it can start to get you down. You don’t get so many happy, or indeed funny documentaries; I think we need more of them. SG: You’re also researching a longer documentary project – can you whet our appetite with some info on that? DC: Yea, I’ve been looking into and filming a few different ideas, I’m just deciding on which one feels like it’s worth perusing the most. A lot of it is about context too. I have a huge bank of film ideas I want to make, what I need to think about is “why this film now?” Would this film be a better film if it was made in 10 years time rather than today, and what films won’t I be able to make in 10 years time that demand to be made right now? What would be a lot easier would be if I discovered a family member I never knew existed, or maybe if Channel 4 would like to commission me to film a documentary on a nice slow Summer’s cruise somewhere relaxing? I’d probably set aside some time to do that. SG: Oh, and one thing that’s been on my mind for some time – did you ever replace that lamp? DC: Yes, well, my Mum replaced it when I was on holiday. I didn’t really have a say in the matter. In fact it’s been replaced again since then, with a set of two lamps that have touch sensors that turn them on and off. She’s out of control. You can follow what Duncan is up to next via his twitter account.